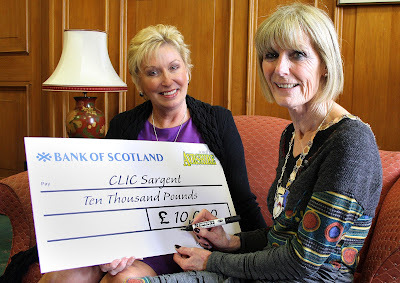 In one of her last official duties before retiring, outgoing South Ayrshire Council Provost Winifred Sloan surprised May Gilchrist, from children’s cancer charity CLIC Sargent, with a fantastic donation of £10,000. 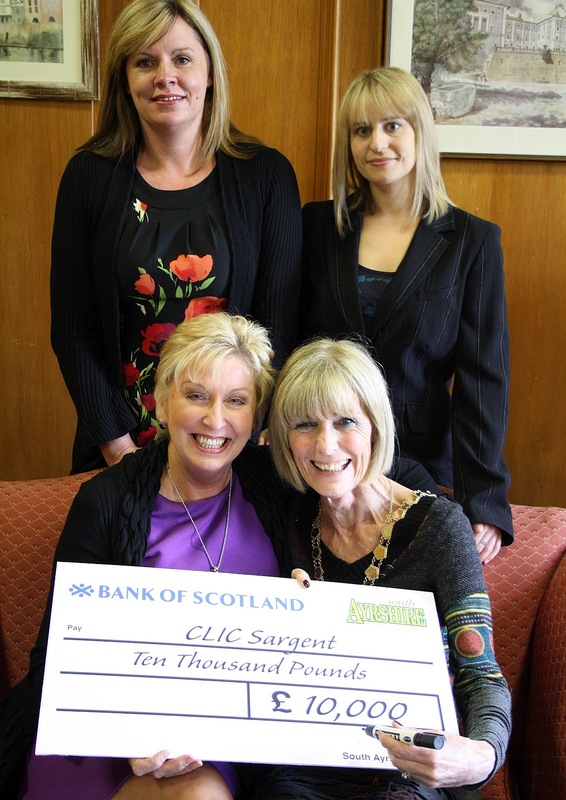 The Council’s Charity Group selected CLIC Sargent as their charity two years ago. Provost Sloan said: “We’ve been hard at work raising money for this well deserving and worthwhile cause. “In that time, we’ve raised money in all sorts of ways, from dress-down days, raffles at the Council’s Outstanding People Awards, bag-packing by pupils, car washing, Rabbie’s Run, afternoon teas, coffee mornings and much more besides. May Gilchrist commented: “I knew the Council was raising funds for us as their nominated charity, but I had no idea their efforts had been going so well. “I was literally blown away when Provost Sloan turned the cheque over and I saw the amount on it. It’s an incredible and very welcome donation, as we depend entirely on public support to keep Malcolm Sargent House going. “Provost Sloan has been one of our most timeless supporters and, from a personal point of view, the presentation was a bitter-sweet moment for me. “On one hand, I’m grateful for the money which will help us in our work to offer support and encouragement to every young person with cancer, or families affected by it. On behalf of us all at Malcolm Sargent House, I’m very grateful to all those at South Ayrshire Council who have been so generous with their time, support and cash to get to this amazing milestone. Provost Sloan added: “Malcolm Sargent House is a wonderful place where kids with cancer and their families can come and have a holiday by the sea. It costs half a million pounds to run every year and, since it was opened in 1994, it has hosted almost 8,000 families – some tens of thousands of people. “Every day, 10 families are told their child has cancer, and the staff at Malcolm Sargent house offer those children and families a well earned break, helping them to come to terms with what is happening.